The following post contains some notes created for installing a FAS2240-4 (HA Pair) with DS4243 shelves. This mainly covers the updating software and firmware piece after powering up the shelves and controllers including: initial setup, upgrading Data ONTAP 7-Mode software to version 8.1.2, upgrading Service Processor firmware to 2.1.1, upgrading disk shelf firmware on the FAS2240-4 IOM6E’s to 0121, and DS4243 IOM3’s to 0152. Note: NetApp recommends to avoid numbering external shelves from 00 to 09, but if you’re requested to use 01, 02, 03, ... , that’s okay and we can sort of make an exception with the FAS2240 since it is a shelf in itself unlike the grander FAS 3XXX and 6XXX's. On first boot, the NetApp filer will automatically boot into the setup script. What we do in the initial setup doesn’t really matter; the setup can be re-run at any time by simply typing setup from the ONTAP CLI. Note: You will need at least one IP address for e0a, e0b, e0c, e0d, or e0M – otherwise the setup script will loop back to asking for an IP from e0a… A tip – if you’re not configuring any of these for the customer, and just doing the SP – is to enter an IP for e0a, and then do an ifconfig e0a 0.0.0.0 later. To run diagnostics before handing the system over to a customer, use SLDIAG (if AUTOBOOT is set, you will need to interrupt the boot) from the LOADER> prompt. At the LOADER> prompt type boot_diags and from the *> prompt, we can execute the sldiag command. Download and install the Config Advisor (Wire Gauge) GUI tool, to run diagnostics and verify cabling. Download and install the System Manager GUI tool. System Manager 2.1 includes the Network Configuration Checker too. Note: In 7-mode, this disk is assigned to whatever controller the command is run from! We’ve run through the setup and have our 2 Node Cluster (CLUSA) up and running, what elements make up this 2 node cluster? A good grasp of the elements that make up a cluster, helps make the whole thing relatively easy to understand. How to Find the Information? 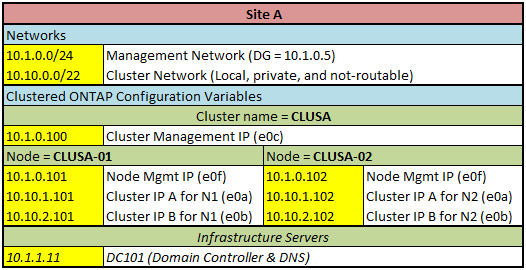 The above lines remove port e0d, and e0e from the failover-group clusterwide, so that the cluster management IP can exist only on e0c on CLUSA-01 or CLUSA-02. 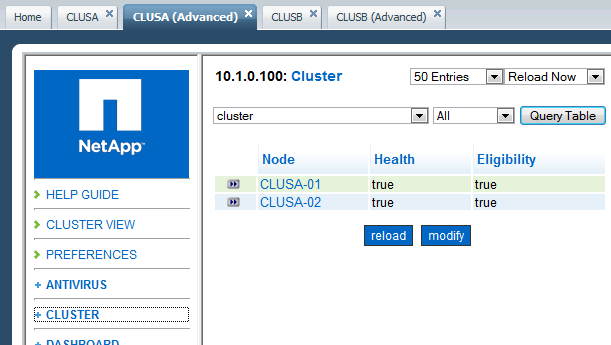 And will migrate the LIF cluster_mgmt to CLUSA-02’s port e0c. Note: When the node homing the cluster_mgmt LIF is rebooted, the port fails over to a port on the other node. Note: By default on the 8.1.2 C-Mode SIM, autoassign is turned on. In this lab all disks are assigned anyway, its useful practice though to check this is off. To learn more about Clustered ONTAP, the lab design from Series 01 has been much simplified using some of the lessons learnt in the process of setting up that lab. Here, we have 2 x 2 node clusters – one 2 node cluster in each site – which should be sufficient to get a basic understanding/working knowledge of the administration/concepts of Clustered ONTAP, including Peers. The IP Addressing, Networks, and Naming Conventions have been simplified too. All the details required for the basic setup are contained in the tables below. Following through the build recipe here, is enough information to get the lab up and running. Note: Having the domain controllers is optional at this stage, also, there’s no reason why – for a lab – we could not have everything in the same subnet. The basic setup (skipping adding the optional additional shelves from the build recipe) is relatively simple to do and can be done in less than an hour – that’s for two up and running clusters; even adding the SIM shelves (8 shelves, 2 shelves for each of the 4 nodes) shouldn’t take much longer. Now to do something interesting with it! 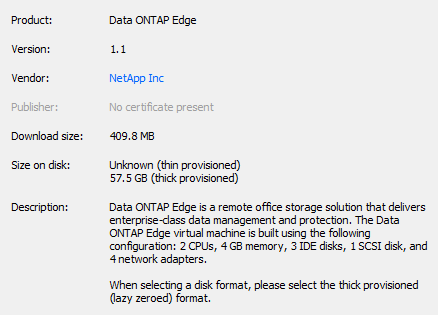 The final element of the lab is deploying the Data ONTAP Edge appliance. Since we have the 7-Mode and Clustered ONTAP SIMs, the Edge appliance (which is DOT 8.1.1 7-Mode) is not essential for this learning lab, still, it’s nice to get it out of the box and have a look. Here starting with a VMware ESXi 5.1 host (ESX111 in our lab), with 8GB RAM, and a 70GB local datastore. The ESXi host belongs to a VMware vCenter. And that’s it, now for the second ONTAP Edge! The image below shows the complete lab in VMware Workstation – two 2-node Clusters, two 8.1.2 7-Mode SIMs, and two 8.1.1 7-Mode Edge appliances as seen in OnCommand System Manager 2.1. 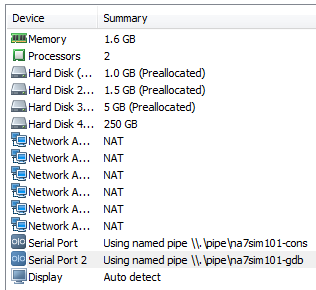 This completes the setup of all the NetApp lab elements as outlined in part 1, from here on we’ll mostly just be using the SIMs and leave the Edge appliances powered down. The Edge appliance – especially since here it’s running in a virtual VMware ESXi host, something it’s not designed for – consumes a lot of CPU resources, whereas the SIMs tick over nicely. Note: I’m using the same cluster network as before! 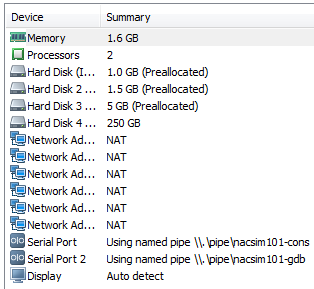 Substitute the variables above where required when following through http://cosonok.blogspot.com/2013/02/lab-series-01-part-4-netapp-data-ontap.html to set up the lab. 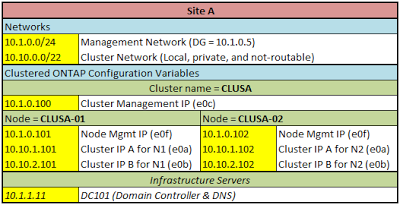 In real-world scenarios, having local clusters and then SnapMirroring to remote clusters is more likely. Stretched networks are notoriously difficult to set up efficiently depending on the distance involved – with latency issues, broadcast traffic, limited bandwidth, jitter, network hops, network resilience … all these issues coming into play. 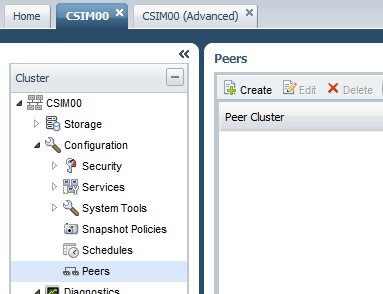 Also, there is the option to create a Peer Relationship from one Cluster to another, something I’ll be looking at in later labs. The following how-to-guide is a concise recipe to setup the Data ONTAP 8.1.2 7-Mode Simulators which we will call NA7SIM101 and NA7SIM201. Note: Notice that the DOT 8.1.2 7-Mode SIM has a thin-provisioned 250GB Hard Disk 4. The below recipe is for NA7SIM101; repeat for NA7SIM201 replacing the variables (in red) as required. Boot the simulator – NA7SIM101. System initialization has completed successfully! Note 2: You’ll find quite a few of the licenses are pre-installed. (Optional) Adding 2 More Shelves, Moving the Root Volume, Replacing the Original 2 Shelves with Larger Disks, and More! The 8.1.2 SIM comes with a larger 250 GB VMDK (thin-provisioned) disk than the 48GB disk on the 8.1 SIM, but to take advantage of it we still need to add additional shelves, we can add two more shelves, with 2 x 14 x 4 GB disks, move the root volume (nice to know how to do) then re-populate the original shelves with 2 x 14 x 4 GB disks. This will gives us two aggregates with roughly 92GB usable space each! Finally, halt the simulator filers and take a VMware workstation snapshot before we get to play and break things!